Moreover, though Beijing plays up the voyages as a triumphant Chinese adventure, the journeys had a distinctly Muslim character. 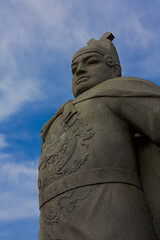 Zheng practiced Islam, as did Ma Huan, the main chronicler aboard the ships. It’s likely they were guided to their many ports of call, such as Malacca, India’s Malabar coast and Malindi in Kenya, by Muslim pilots of Arab, Indian or African extraction. “They were essentially following maritime routes that had been in use by people in the Indian Ocean for ages,” says Wade. Many academics argue that the popular Arab-Persian tale of the Seven Voyages of Sinbad, littered also with snippets of Indian folklore, was derived from the real travels of Zheng He â€” making the mariner as much a pan-Asian protagonist as a Chinese one.